This unit will take you through setting up the appropriate page layout for task objects. This unit assumes you have completed the previous units in the Fastcall Setup module. This unit also assumes you know the basics about administering objects, profiles and page layouts in Salesforce. Fastcall adds some custom fields to the Salesforce ‘Task’ object. In order to get the most out of Fastcall, these need to be exposed on a page layout so users can see them. 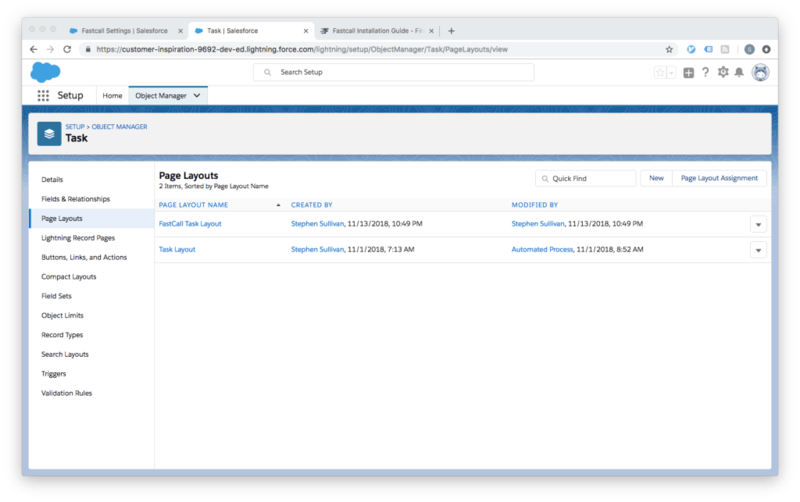 Fastcall comes with a suitable page layout that adds these to the default Salesforce page layout, but this page layout must be enabled by the Salesforce org administrator. 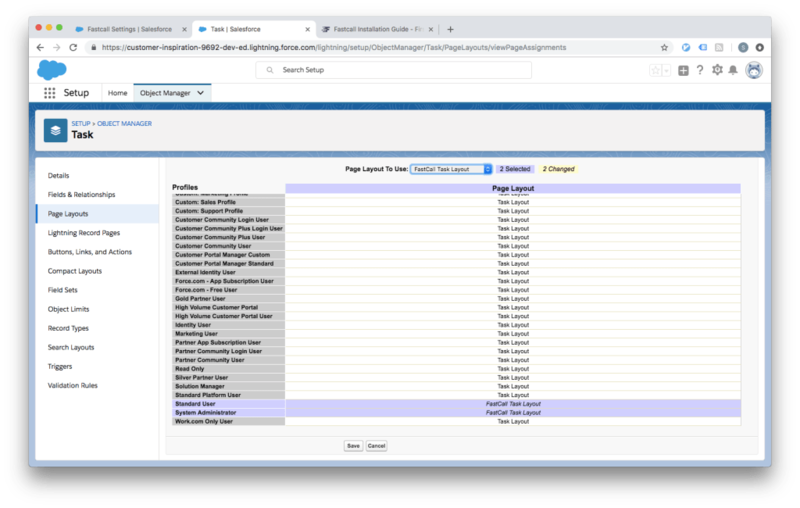 You may wish to modify these steps if you have made changes to your user profiles, the task object or its page layouts in your Salesforce org. You may wish to skip these steps entirely if you will configure Fastcall so that it does not create Task objects. Open your Salesforce org’s Setup menu and navigate to the ‘Task’ object in the Object Manager. You will see an additional page layout called ‘FastCall Task Layout’ has been created. Choose ‘page layout assignment’, then press ‘Edit Assignment’. Choose the profiles for ‘Standard User’ and ‘System Administrator’ and change them to the ‘FastCall Task Layout’, then click ‘Save’. You can see the changes for yourself when you do the unit Seeing the Details of a Call with a Task Record, but for now, continue with the remaining units in the Fastcall Setup module.